I have an Instagram account where I post most of my food photos – if you want to know what I actually eat from time to time, that’s the place to follow me 🙂 The account is @plantbasedmove. 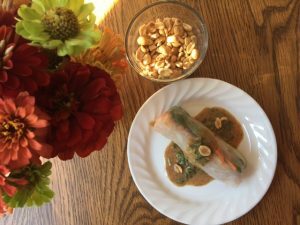 Well, the other day I posted this photo of fresh spring rolls with an almond ginger sauce and several people asked for the recipe. So here is the sauce recipe. In case you were wondering, the spring roll is just rice paper (you can now find brown rice paper – YaY!) dipped in warm water just until softened. Lay it on your plate and fill with a veggies, here’s what I used: a few mung bean threads tossed with a few drops of roasted sesame seed oil, sliced avocado, grated carrot, toasted tofu (cut extra firm tofu into long strips, marinated in Bragg’s Aminos, put on parchment paper in the oven at 375 degrees for about 30 minutes until crispy on the outside, turning several times), fresh cilantro and basil leaves. 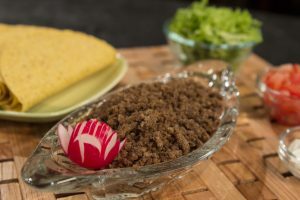 You could also add mushrooms, mung bean sprouts, or grated jicama. Whisk almond butter with the hot water in a bowl. Delicious as a dip for fresh spring rolls.